Is your throat feeling a little sore? Think you may be coming down with a cold? Mix together milk and a teaspoon of turmeric in a pot and heat until it's hot, then pour into a cup to drink. Heated milk and turmeric is a common Indian home remedy for colds, as turmeric contains many anti-inflammatory and anti-bacterial properties. If drinking milk and turmeric does not sound like your cup of tea, you can also drink a bowl of chicken soup, clearing your blocked nasal passageways with a neti pot, and elevating your head at night with an extra pillow to help clear your congestion. 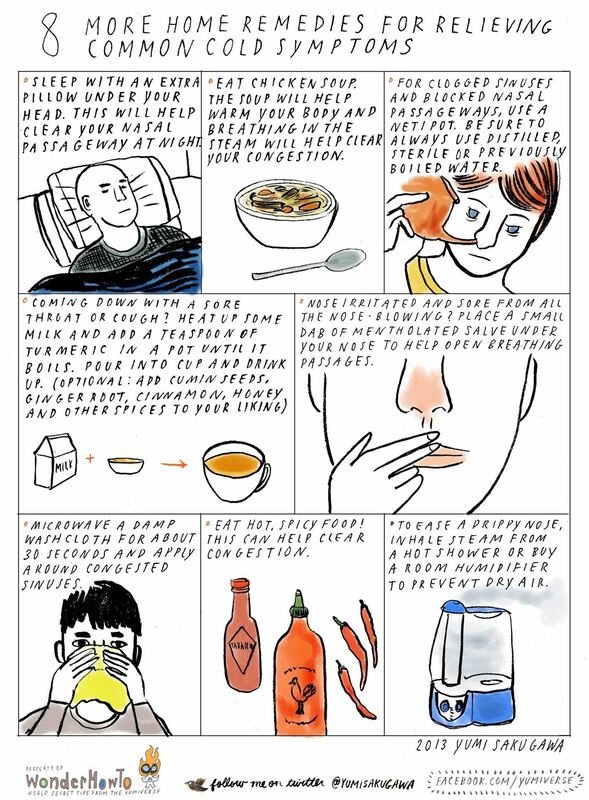 For more cold-related help, check out my previous guide on home remedies for relieving common cold symptoms. If you want to lessen your chance of getting sick in the first place, check out my tips to avoid catching a cold. Got your own favorite home remedies for relieving common cold and flu symptoms? Share with us! I assume it might not work for everyone, but hey, to each their own right ? So I thought I'd take the time to share with you all. I've heard variations of that! Garlic is amazing.